Examples abound of the tremendous energy and creativity of the Millennial generation—from Snapchat and Facebook to the Water Protectors in the deepfreeze of a Dakota winter. Yet established advocacy organizations are still reliant on an aging base of supporters, and struggle to attract the talent and hearts of younger people. How do we bring younger people to support the oh-so-necessary work being done by mainstream organizations? This issue is probably no more severe than in the environmental movement: the typical member of a mainstream environmental group is over 60 and white, probably energized during their youth in the battles over clean air and water. The Oregon Environmental Council, now approaching their 50th year, is no different. But the OEC is doing something about this and herein lies a story worth telling. Five years ago, concerned about its aging (and dying) supporter base, the OEC began an experiment to engage young people, creating the Emerging Leaders Board of young professionals (age 20-40), and asked them to reimagine an environmental movement for Millennials. In 2016, the Brainerd Foundation prepared a case study documenting what this small (15) band of young people were able to do to further OEC’s critical work on climate change, clean water and reducing toxics in the environment. At the same time, having fun, recruiting a younger generation as members and raising funds for OEC. Young people are eager for this type of opportunity. Typically there are ten applicants for every opening, attracting a wide range of young professionals. The parent organization benefits in several ways. Brings a more youthful and hipper face to the movement. Participants benefit from the experience, becoming empowered, connected and experienced in key non-profit skills such as event planning, fundraising and board development. The parent organization must give Millennial board considerable autonomy, creativity and freedom. Participants take their commitment seriously—and their peers expect it with measurable outcomes holding them accountable to each other. Participants are recruited and selected for their diversity in perspectives, professions and experiences. The parent organization must invest staff time to support the Millennial board, ensuring alignment with organization priorities and resources needed to succeed. Millennial board is supported and valued by executive leadership with parent board engaged. Form is flexible and evolving as each year more is learned about capacities and interests of Millennials. The case study continues with ideas for strengthening the effort (education on issues, further engagement in parent board, leadership training curriculum, alumni network), as well as advice for other organizations who think this sounds like a great idea. They conclude “…(W)e believe this is one of several promising strategies for building the bench of environmental leaders.” I heartily agree! 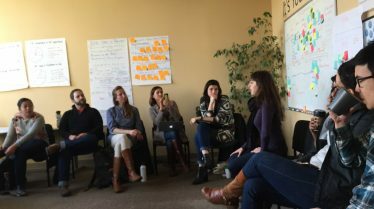 —Rex Burkholder is a board member of the Oregon Environmental Council and has facilitated the Emerging Leaders Board strategic planning retreat for the past 3 years.